Close to numerous transport amenities, this traditional Victorian style terrace house is located on a sought after cobbled street in London. Terraced housing is a series of homes joined together to form a row. 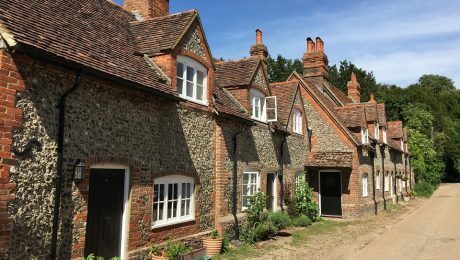 The initial conception of this housing style is largely related to the economic boom and population increase, meaning house builders were able to build as many homes as possible in a small space. In the early Victorian period, the terraces generally consisted of two living rooms on the ground floor, one of which was to be used for cooking, and one or two bedrooms on the first floor. They were very plain, without running water or sanitary provision, and became widely associated with health problems. 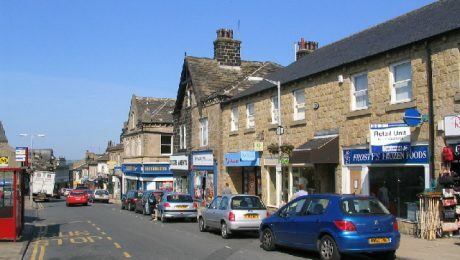 Towards the end of the 19th century, Central Government legislation aimed at improving health standards, as well as a relatively booming national economy, meant a generally rising standard in the quality of terraced homes, and by the end of the 1880s more than half the population were living in more spacious two-up two-downs with running water and drainage. 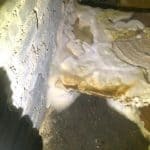 Timberwise South East was called upon to inspect the property as the homeowner had their suspicion of a woodworm infestation. 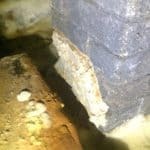 Our instructions from our customer were to inspect the timbers of the ground floor bathroom for wood infestation by wood-boring insect and the cellar area for dry rot. Inspection of the ground floor bathroom revealed the presence of a moderate widespread wood borer infestation in the flooring timbers. The types of woodworm beetle and wood rot infestation noted were Common Furniture Beetle (Anobium Punctatum) and Wood Boring Weevil (Euophryum Confine). Terraced houses were introduced to London from Italy in the 1630s. Covent Garden was laid out to resemble the Palazzo Thiene in Venice. Common Furniture Beetle, as its name would suggest is by far the most common cause of woodworm damage encountered. Its speciality is specifically sapwood of softwood and European hardwoods. 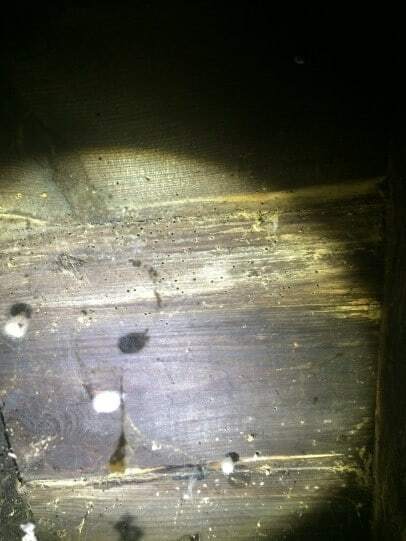 As you can see in the photographs above, Common Furniture Beetle holes are approximately 1.5mm to 2 mm in diameter, often surrounded by the insect’s excrement, otherwise known as Frass. Woodboring Weevil, on the other hand, tends to a smaller insect, known for its long snout and most commonly found on damp skirting boards and embedded joist ends. 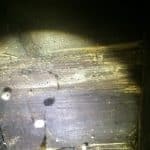 Whilst inspecting the area of the cellar and underside of the ground floor our surveyor acknowledged that while some timber renewals and dark stain protection to the joists had already been applied, the active woodworm still remains in some flooring to the adjacent flat. 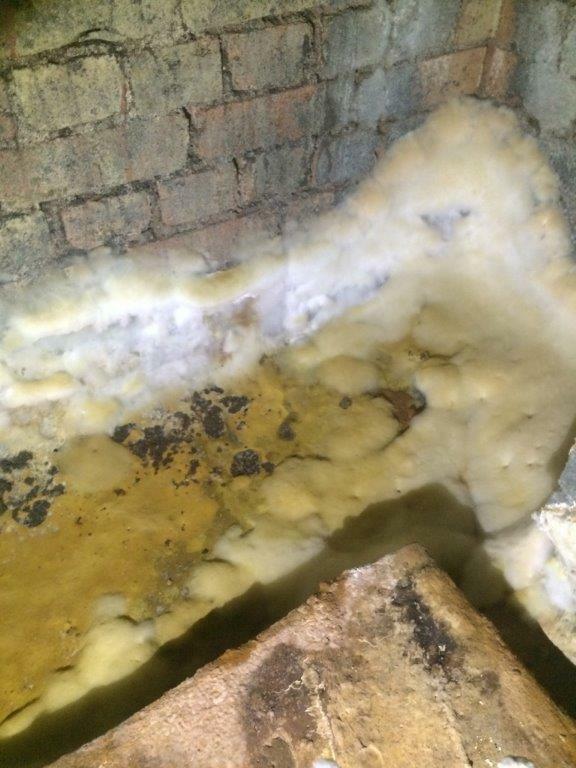 A severe outbreak of True Dry Rot was noted to the cellar floor extending to the exposed and painted brickwork of the storage bin areas. 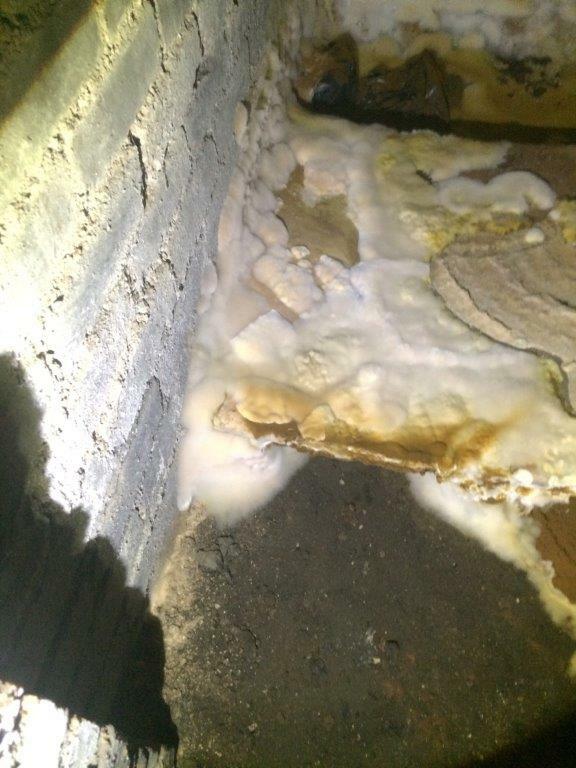 Dry rot spores are considered omnipresent and no environment is considered free from them. The spores will germinate and grow in timber with a moisture content of between 20-30%. The fine fungal thread (hypha) digests the cellulose and hemicellulose fraction of the wood but does not attack the structural lignin. These remain as a brittle matrix which cracks into cubes and differential stresses. 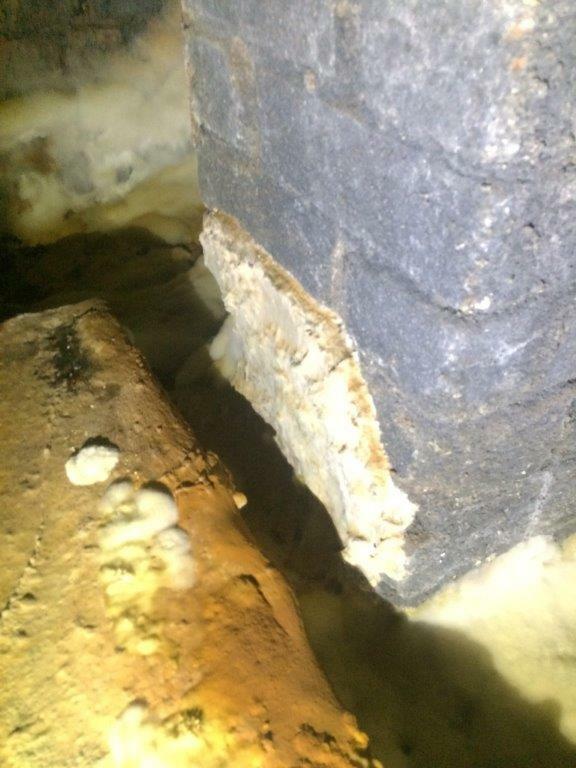 Cuboidal cracking is also characteristic of many wet rots and does not automatically indicate the presence of dry rot. 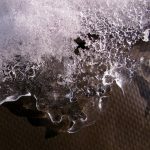 Fungal hyphae may clump together into a variety of structures known as mycelia which takes various forms depending on the surrounding conditions. They may fill a humus cavity as a ball of cotton wool like mass or grow across the surface of the timber as a grey/white skin. In order for Timberwise to gain adequate access to the flooring, the bath itself needed to be unplumbed. Our technicians then replaced the mechanically unsound flooring and chemically treated the entire bathroom using an insecticidal solution. To assure our customers that the work had been carried out correctly, our technicians advised that in the treatment of timbers for the eradication of wood borers, it may be possible that a few deep-seated larvae would escape the immediate effect of the woodworm treatment as a result of being below the limit of chemical penetration. These larvae could subsequently emerge as adult beetles in three years following the treatment. In the case of Death Watch Beetle, the period of emergence may be even longer due to their long woodworm life cycle. 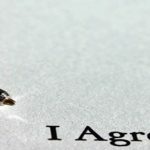 Should this happen, the beetles will die upon emergence but would give the impression that re-infestation has occurred. 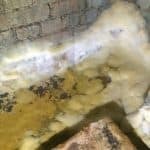 To eradicate the dry rot infestation, our technicians cleared away the mycelium from the floor and brickwork and then suitably drilled the brickwork a metre beyond the last signs of the infection. Following this, our technicians sterilized the floor with a fungicidal solution. 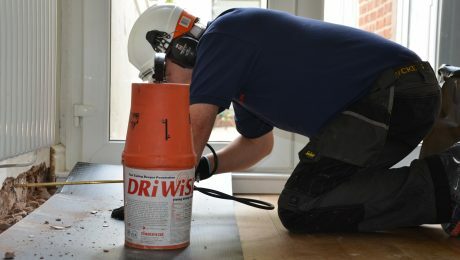 If you suspect woodworm is occurring in your property click the following link to see how woodworm treatment is carried out. If you feel you may need us to carry out a woodworm survey, please feel free to chat directly to one of our property care team who would be delighted to help you further. Simply request a property survey online and we’ll help you with your property care problem. Alternatively, give us a call on 0800 288 8660.